Swords and sorcery go hand in hand when discussing role-playing video games. Perhaps due to the influence of Dungeons & Dragons, even the earliest RPGs provided players with the chance to to unleash a myriad of spells upon unsuspecting foes. Often, however, these spells have esoteric names which may or may not actually convey the effects of the spell, and casting one takes a valuable turn in battle just for the possibility of learning it. Encouraging players to use them is a tricky design problem, and while a variety of answers exist, we’re going to be looking at one of the earliest: the spellcasting system in Dragon Warrior. Get used to this interface. It’s where you’ll spend most of your time in Dragon Warrior. 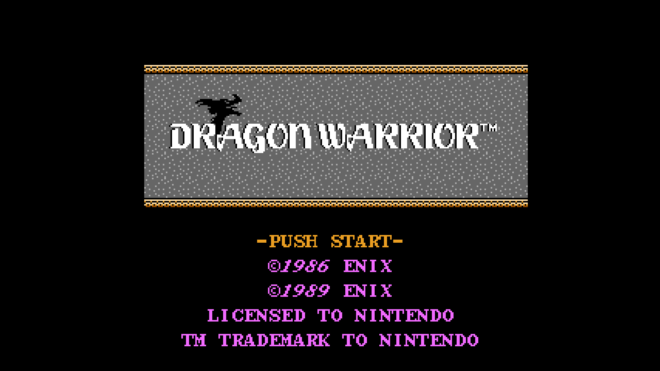 Dragon Warrior released in 1986 in Japan as Dragon Quest, and made it to North America three years later with a name change due to conflicting trademarks. While it may seem archaic by modern standards, its simple systems created a framework that codified what became known as Japanese role-playing games. Its gameplay is slow and progress is rarely direct, but the basic character progression, colorful array of enemies—with more than a few palette swaps—and far-reaching menace are all present in this first installment. 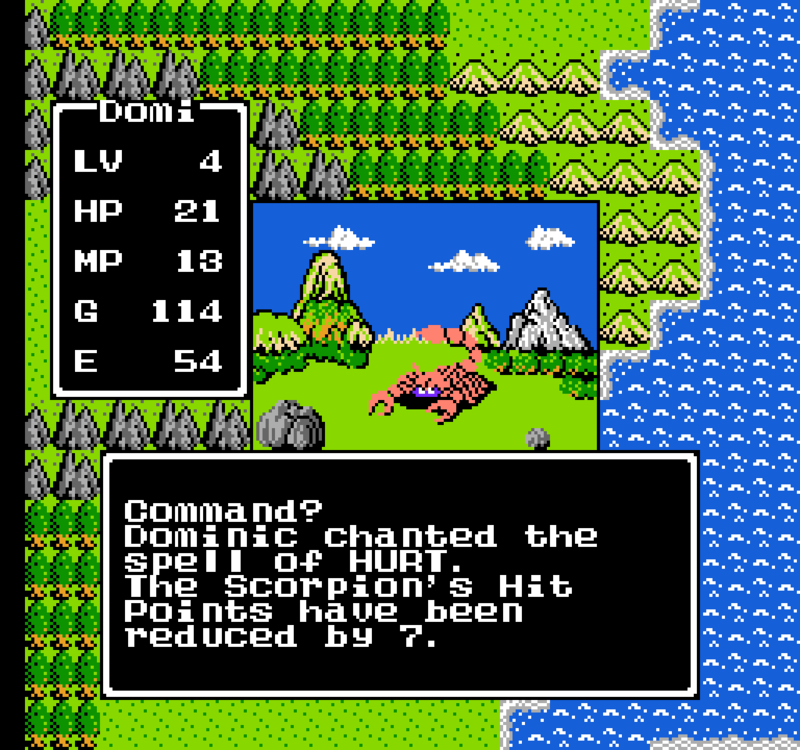 The first aspect of Dragon Warrior’s spells which sets it apart from many predecessors—particularly Dungeons & Dragons itself—is the way it names spells. 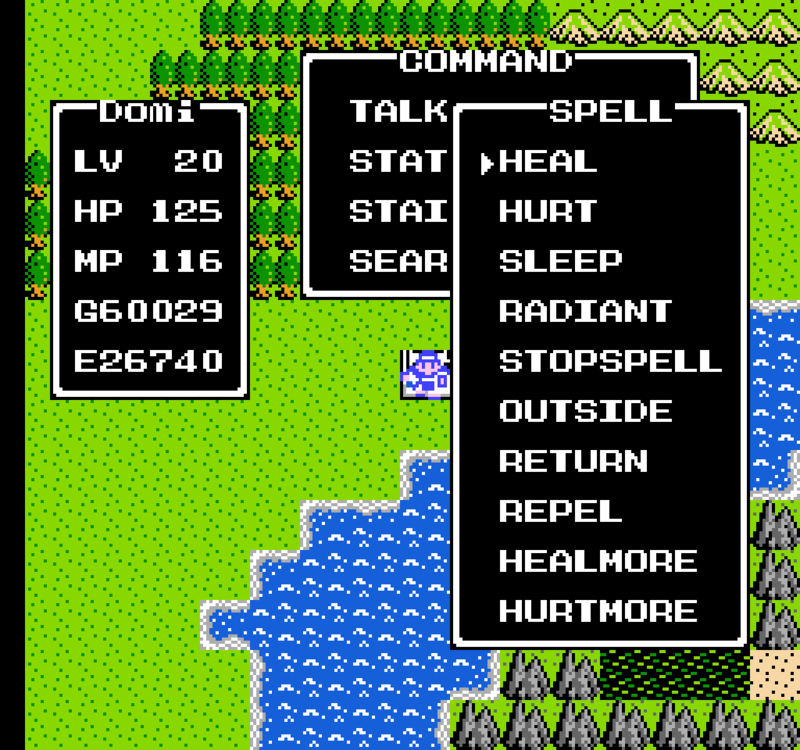 Where D&D has spells such as Friends, Shillelagh, and Power Word Kill, among a massive list of others, the spells available in Dragon Warrior are as follows: Heal, Hurt, Sleep, Radiant, Stopspell, Outside, Return, Repel, Healmore, and Hurtmore. A short enough list that it all fits on one screen. Granted, the spell lists are intended for wildly different purposes and D&D allows for a vast range of more adaptive play, but the effects of Dragon Warrior’s spells are inferable from their titles alone. Heal recovers health, Healmore does the same thing but better. Sleep puts an enemy to sleep, Stopspell stops an enemy from casting spells. 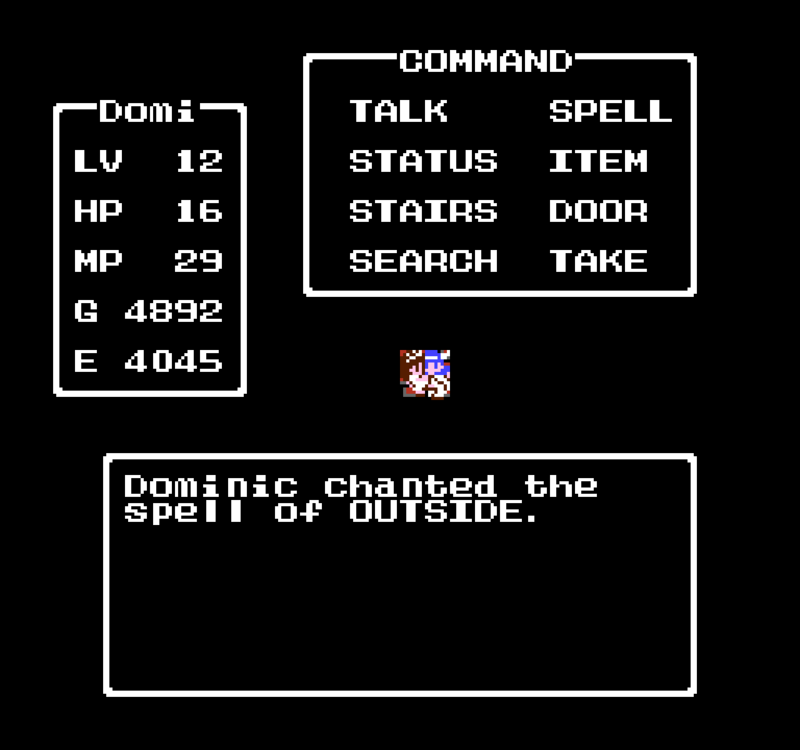 The less immediately clear spells still make sense in context: Radiant has the effect of a torch except stronger, Outside instantly exits a dungeon, and Return teleports the player back to the castle, which is the only place they can save the game. More magic points are an excellent accompaniment to a new spell. Clarity of function is great, but it doesn’t mean a whole lot if there aren’t opportunities to make use of them. To discuss when these opportunities occur and how they lead into one another, I’ll need to use a couple of graphics. 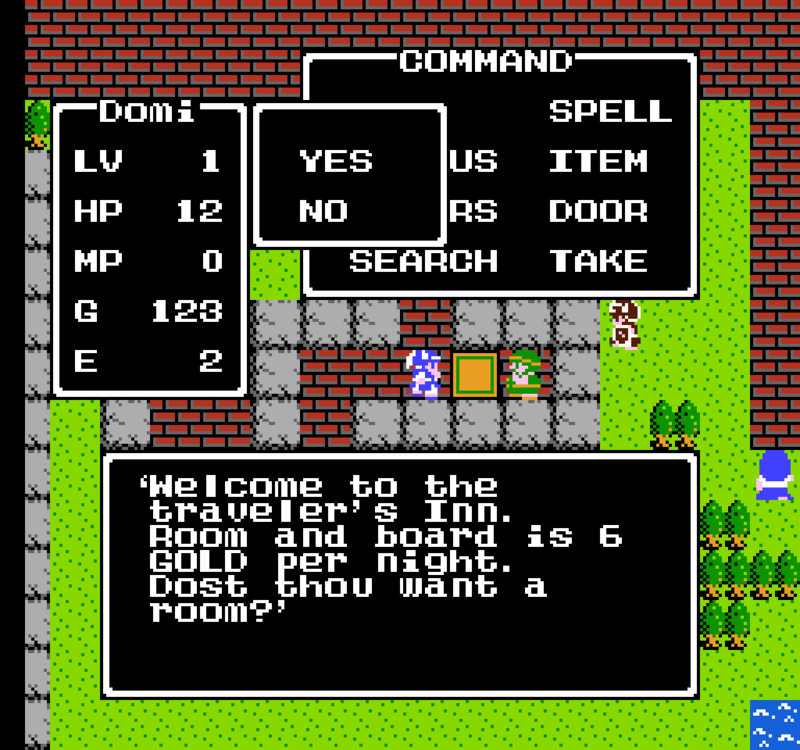 The first is a table of the level at which the player learns each spell. The second is a map of the overworld divided into sections based on which monsters appear where. 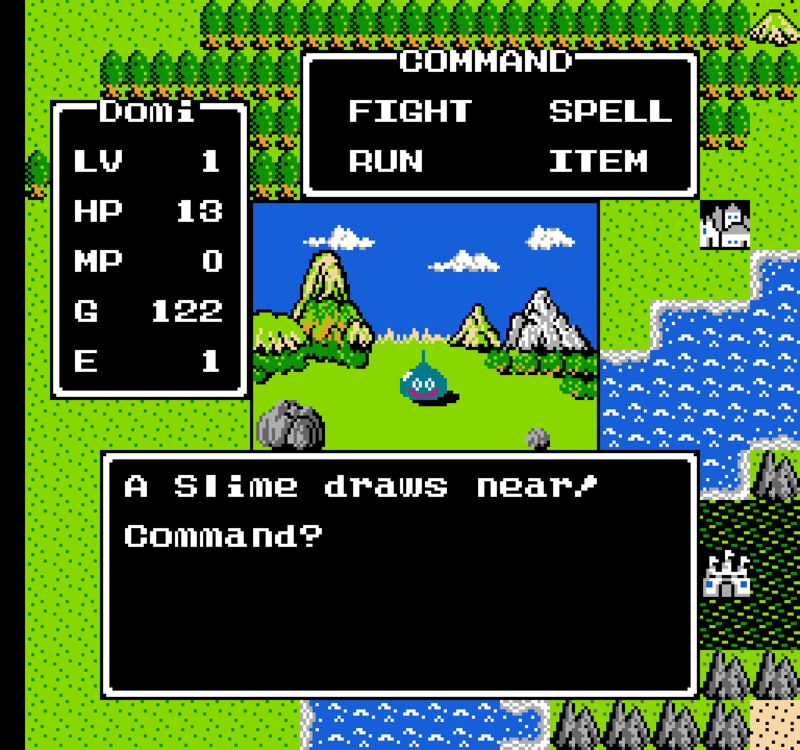 The map is available here, on a Dragon Quest series fansite called Dragon’s Den. The table is included below. 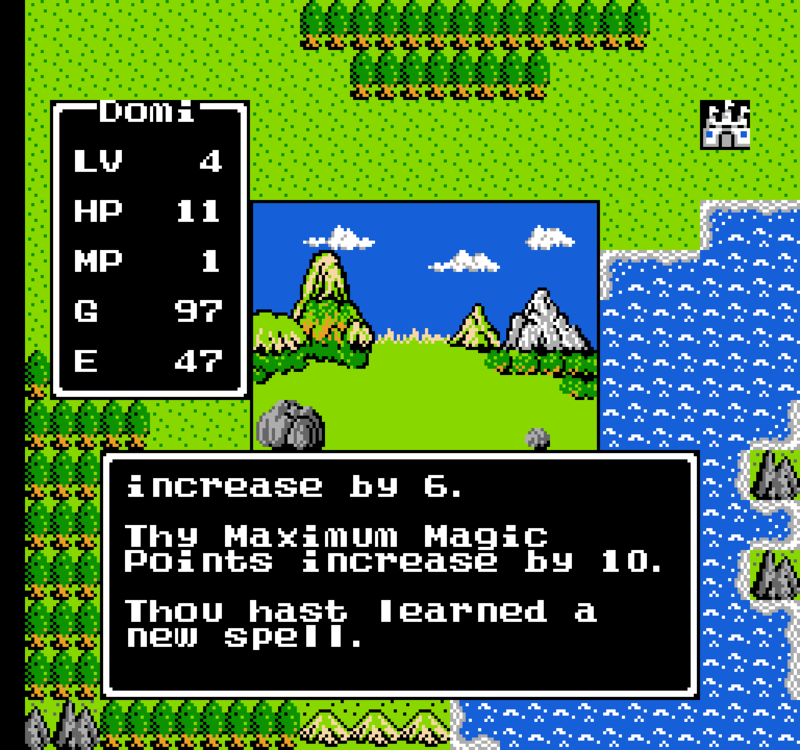 With this information available, let’s walk through some of the progression in Dragon Warrior and see how the game encourages players to use new spells. The player begins at Tantegel Castle, a little northwest of the middle of the map. Enemy encounter rates are lower here than anywhere else in the game, and the only foes present are simple Slimes and the occasional Drakee a bit further afield. Six gold may not seem like much, but those Slimes are stingy and new equipment is expensive. None of these are terribly threatening, but it takes a few battles to accumulate enough gold for the neighboring town’s inn. This can be problematic, but the player learns Heal at level 3, and an old man in Tantegel fully restores their MP for free, allowing them to save money for better equipment instead. At the next level, the player learns Hurt, which in turn gives them a greater capacity to deal damage and take out the Scorpions to in the hills just south of the castle—much faster for experience than Slimes and Drakees. Scorpions are a bit scarier than blobs of goo, but a liberal application of fire works wonders on arachnids. These Scorpions suffice until about level 8, when the mountain cave to the west becomes a better option both for levels and for gold. 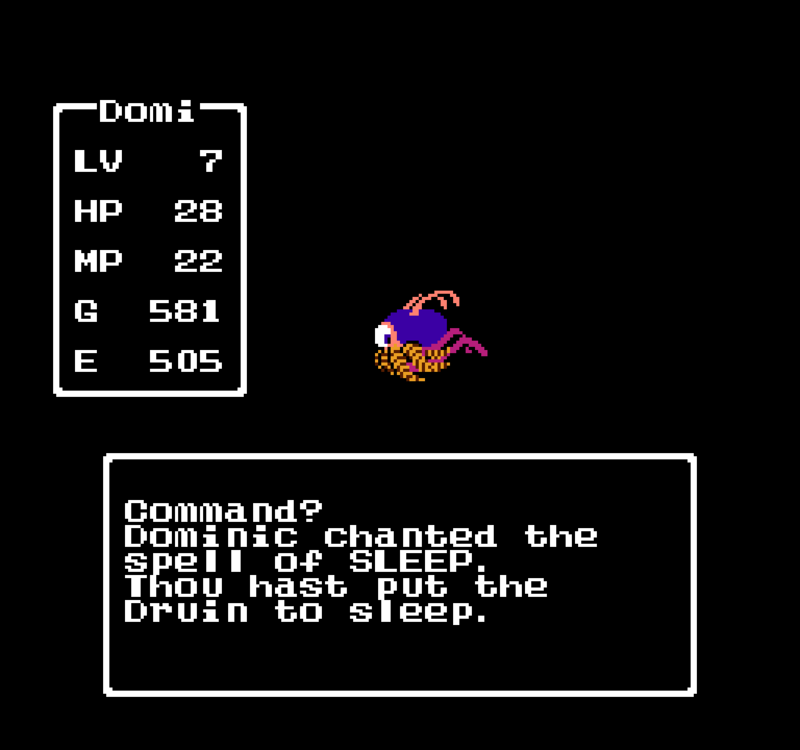 The denizens of the cave are powerful, but they’re also incredibly vulnerable to Sleep, the most recently learned spell. They may sleep with one eye open, but this will keep enemies at bay long enough to overpower them. Putting enemies to sleep is an inexpensive way to near-guarantee a free hit or two, tipping the balance in the player’s favor. A few levels—and a fair bit more gold—later, the plot will more than likely have led the player through Erdrick’s Cave, Garinham, and Kol, possibly on into the southeastern continent around Rimuldar. The enemies here hit harder than any the player has faced so far, and their health and defense are enough to survive a fair few blows at around levels 10-12. Worst of these is the Warlock, whose spells neither miss nor take defense into account. With spells blocked, the Warlock spends its turns futilely attempting to hurt you or put you to sleep—though that staff still hurts if they hit you with it. With bad luck, the player may fall to a Warlock in two or three spells…unless they use Stopspell, which renders every one of the enemy’s spells a wasted turn. With this spell, Warlocks quickly fall from the greatest threat to easy experience. The immediately useful introduction of spells slows down at this point, but it’s about halfway through the game—plenty of time for the player to be acquainted with spells and know how to make use of the new ones they earn. With princess in arms, Outside saves a lot of blind wandering into walls—unless you were to use Radiant instead. Outside becomes useful as the plot drives them underground more frequently, Return is the only form of fast travel the game offers—essential as objectives become farther from Tantegel—and Repel makes the walk to these objectives a bit smoother. By the time they learn Healmore and Hurtmore, the two amped-up spells become icing on the cake of their repertoire, and the boosted effect of Healmore becomes instrumental to surviving the final confrontation with the Dragonlord. Even at level 20, your health is only barely enough to withstand 2 attacks. Healing is a must. 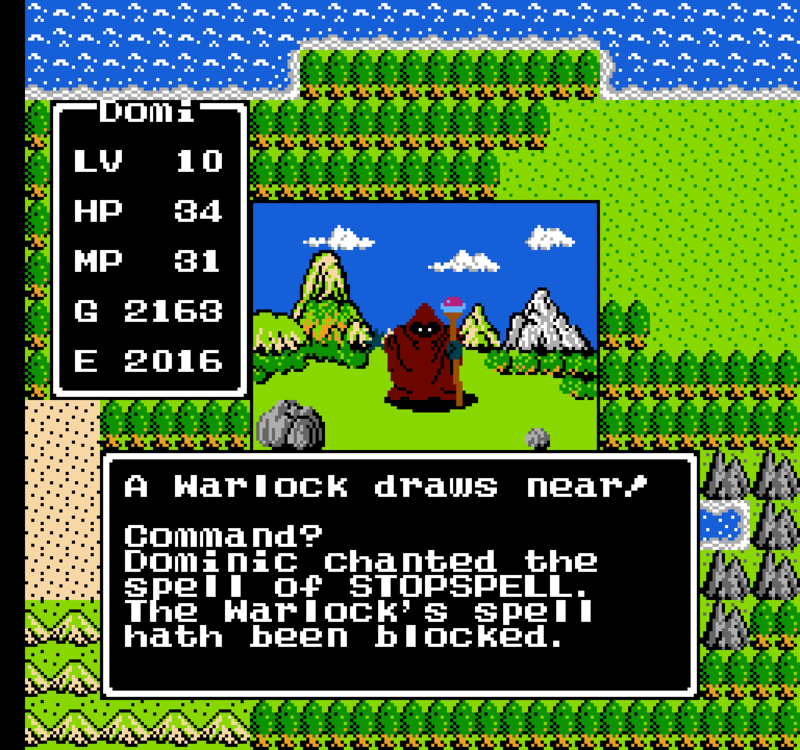 No point in Dragon Warrior requires the use of a spell—though the chances of winning against the Dragonlord without healing are nearly nonexistent at any reasonable level. 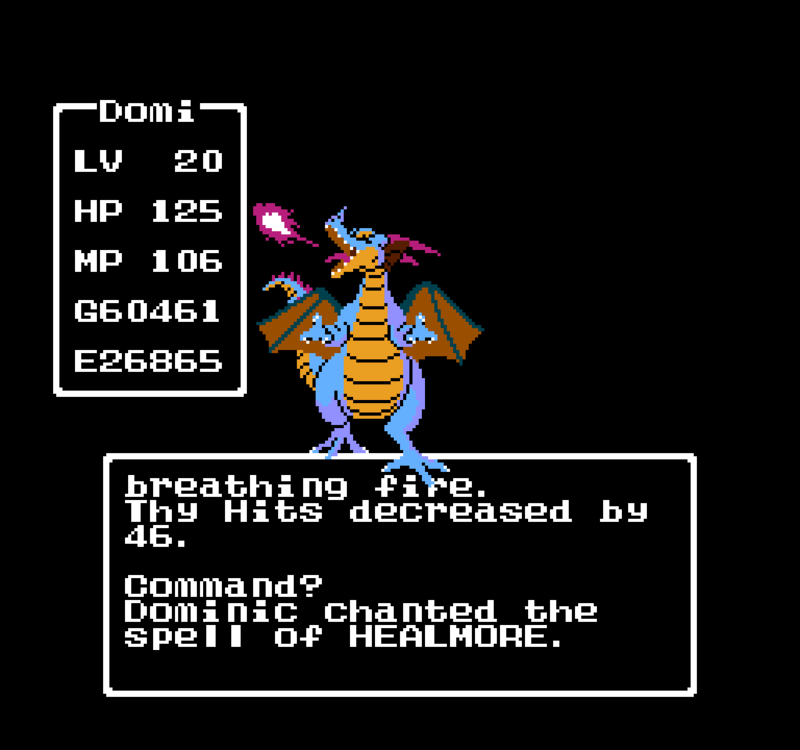 However, with names that clearly indicate their functions and introductions in places where using the spell is near-guaranteed to have an effect, Dragon Warrior makes spellcasting accessible and intuitive even when plot progression isn’t. Thirty years of games have made all kinds of improvements, but even the otherwise archaic maintains its merit if one is willing to look closely.